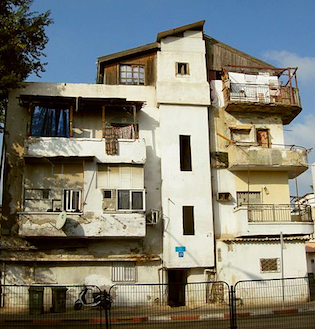 They’re renovating our Tel Aviv building just as soon as we get the 10 Jews who live here to agree on everything! Tel Aviv: OMG this Tama-38 thing is incredible! So this is how it works: A contractor moves all the people in your building into a different apartment for a year or two, knocks down the building, and rebuilds it! You come home to a modern apartment! The contractor builds two additional floors and gets to sell 4 flats. You get an apartment with parking, less mold, and a real kitchen! The city increases the supply of available housing. Everyone’s a winner! Only in Israel! I mean, it’s really Too easy! We just have to get the 12 Jews who own the apartments here to agree on a multi-year complex financial agreement! What could go wrong? I mean we just have to get together the guy on the first floor who feeds the cats along with the family on the third floor who hates that he feeds cats. And the guy who does his daily motorcycle maintenance in front of your building. Also the family with the mysterious Sephardic cooking smells. And the crazy lady from the ground floor who left her gas on all weekend once. Let’s not be pessimistic. We’re Jewish, we can do this! It’s just like in synagogue when we agreed to change the time of morning Minyan to…. wait a second, actually we got in a huge fight and half the guys aren’t speaking to the other half anymore…. OK OK…. we’re a miracle in the Desert! We can make this work just like they do in the Knesset! But we are definitely going to get this done. Maybe just to speed things up we could bring in Efficiency Experts from the Misrad HaPnim! So when is it going to happen? Oh I don’t know, what’s the weather like in Gehinnom this week? Cold? Ha Ha! Just a joke! Actually, you can expect an invite to our renovated flat’s housewarming just in time for the Hanin Zoabi/Matisyahu reggae duet!